Although many of our grants go to churches, No Child Goes Hungry partners with other groups who are dedicated to erasing childhood hunger in their communities. Check out these wonderful organizations who are doing great work in their communities. 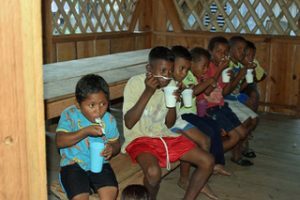 With the help from an No Child Goes Hungry grant, One Earth Conservation, provides foods and snacks to children in multiple villages in Honduras. Even though most donations have to be bussed or flown in, a grant for food goes a long way there. One Earth Conservation estimates that ten more villages will receive food in 2018 from their grant.